I am not a professional translator but I like translate some good articles between Chinese and English. I use dictionary a lot while I doing translation. 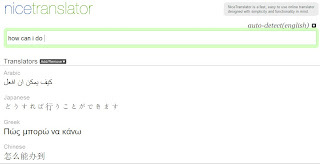 I always interest about some dictionaries or online translators. Anyway, they help me a lot when I stuck some words and sentences. 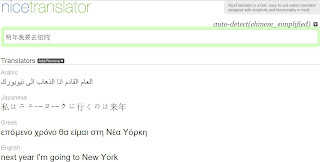 Nice Translator is an online translator that uses own way to translate words and sentences automatically. As its name, it is a nice translator, you can choose one or several languages that you wanted, it supports over 30 languages. Then, type your words or sentence in your language, it will translate that into other languages that you picked automatically. It is cool! I think that is very useful to write greeting card to your friends in different languages.